Most all of it should be there except the SG-1 novella Behind Enemy Lines which is post legacy and the short stories from the Homeworlds collection. At least one of the SGA ones is post legacy. I would think they'd do it eventually. We've had 2 of the novella's published in print and I think some of them have been included in the anthologies? Dying for some information on some new novels. Writing as fast as I can! 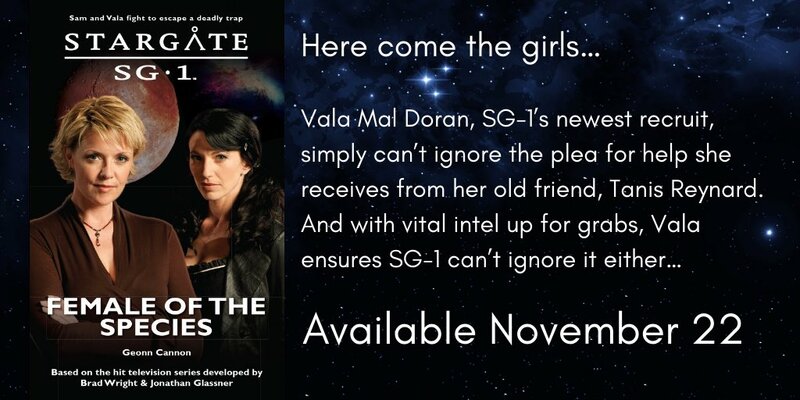 I haven't been watching Stargate, or keeping up to date on the novels, for a long time. It was a wonderful surprise to see that there are so many new novels for me to catch up on. The dead-tree edition is now available for this novel. I thought I would post this as I saw it on stargatenovels.com. Firstly, we would like to thank all the readers who have faithfully purchased books from our site directly - we appreciate your loyalty over the years to Fandemonium and Stargate novels. However, there are risks to our business from continuing to sell directly which we can no longer avoid, namely data protection regulations, the risk of a cyber attack and the cost of maintaining inventories of over 60 Stargate titles in multiple locations. So reluctantly we have decided to close the online store which means that paperbacks will only be available from Amazon and a few select convention dealers. There will be no change to ebooks which will continue to be available through Amazon, Crossroad Press and a wide range of other ebook providers. For our European readers, we will work on getting paperbacks back into stock at Amazon UK. Apologies in advance for any inconvenience while we make these changes, but we hope that you continue to enjoy the books. I gave up and ordered a print copy via Amazon.com. Guess I'll do that going forward. My book arrived yesterday. Disappointingly not very well packaged so the book spine is dinged but not too bad. Looking forward to giving it a read! Just throw up spoiler tags! It's a shame they never did individual threads for each novel that came out. That's how I handle it for my non-Stargate community. Otherwise, just check out Amazon reviews. it just felt like everything moved along despite not being how SG-1 planned it at all. I know Geonn hangs a lantern on it but it just felt a little off to me. I still enjoyed it, though. Was a pleasure to read. You can still ask the mods to make a subfolder for Stargate novels and then you can open a thread for every single novel. Thank you, guys. I enjoy Fandemonium novels, I am actually obsessing with them recently, as they are what keeps the gate open when there are no new Stargate TV episodes out there. Female of the Species was an enjoyable read, even though I have some issues with it and even though seasons 9/10 are not my most favorite ones. But the voices are perfect, especially Sam/Vala. I rewatched Forsaken recently and I need to say that I like Tanis in the novel so much more than in the episode! My most current obsession is Atlantis Legacy series. I am in the middle of it and enjoying it hugely. That means something, as my first choice has always been SG-1 and not Atlantis. But this series has really got me captivated. There's something to be said for EU where it does keep going past the show and the entries are actually allowed to have consequences. We have a new SG-1 novel called ‘Within’ by @SParkerSinard currently with MGM for approval!